My most heartfelt thanks go out to Angela Toma, who transcribed this scene for a local community theater performance. She has been kind enough to give me this transcription for the express enjoyment of you, gentle reader. Guard it well, and take it out on special occasions for the edification and amusement of your friends (if you have any). Driftwood: Say, I just remembered, I came back here looking for somebody. You don't know who it is do you? Fiorello: Isa funny ting. Isa just slip my mind. Driftwood: Oh I know, I know, the greatest tenor in the world. That's what I'm after. Fiorello: Why, I'm his manager! Fiorello: The greatest tenor in the world! Driftwood: The fella that sings at the opera here?! Fiorello: What-a-you care, I can't pronounce it. What you want wit him? Driftwood: I wanted to sign him up for the New York Opera Company. Do you know America is waiting to hear him sing!? Fiorello: Well...He can sing loud but he can't sing that loud. Driftwood: Well I think I can get America to meet him half way. Could he sail tomorrow? Fiorello: You pay him enough money he could sail yesterday. How much you pay him? Driftwood: Well I dunno. (Walks off to the side in thought.) Let's see...a thousand dollars a night...I'm entitled to a small profit. (Walks back.) How about ten dollars a night? Fiorello: Ten, ten dollar. Ha ha ha ha ha ha...I'll take it. Driftwood: Alright, but remember I get 10% for negotiating the deal! Fiorello: Yes, and I get 10% for bein' da manager. How much is dat leave? Driftwood: Well, that leaves em...ahhh...eight dollars. Fiorello: Eight dollars heh? Well, he sends five a week to his mother. Driftwood: Well that leaves three dollars. Fiorello: Can he live in New York on three dollars? Driftwood: Like a prince! Of course he won't be able to eat, but he could live like a prince. However, out of that three dollars you know, he'll have to pay an income tax. Fiorello: Oh, is income tax. Driftwood: Yes you know, there's a federal tax, and a state tax, and a city tax, and street tax, and a sewer tax. Fiorello: How much isat come to? Driftwood: Well I figure, if he doesn't sing too often he could break even. Fiorello: Alright, we take it! Driftwood: Alright fine. (Takes out contracts, hands one to Fiorello.) Now here are the contracts. You just put his name at the top and you sign at the bottom. (Fiorello looks the paperwork up and down.) There's no need of reading that because these are duplicates. Driftwood: I say they're duplicates! Fiorello: Oh sure. It'sa duplicates. Driftwood: Don't you know what duplicates are? Fiorello: Sure, those five kids up in Canada. Driftwood: (Looking at Fiorello/audience.) Well I wouldn't know about that. I haven't been in Canada in years. (Pointing to Fiorello's contract.) Go ahead and read it! Fiorello: (Running his hand over the paper.) What does it say? Driftwood: Well go on and read it! Fiorello: Alright, you read it. Driftwood: Alright, I'll read it to you! Can you hear? Fiorello: I haven't heard anything yet. Did you say anything? Driftwood: Well I haven't said anything worth hearing. Fiorello: Well, that's why I didn't hear anything. Driftwood: Well, that's why I didn't say anything! Driftwood: I can read but I can't see it. Don't seem to have it in focus here. (Moving the contract closer to and further from his face.) If my arms were a little longer I could read it...You haven't got a baboon in your pocket have you? Ah. Now I've got it. Now pay particular attention to this first section because it's most important. It says, "The party of the first part shall be known in this contract as the party of the first part." How do you like that? That's pretty neat, eh? Fiorello: No. It's no good. Driftwood: What's the matter with it? Fiorello: I don't know, let's hear it again. Driftwood: Says, "The party of the first part shall be known in this contract as the party of the first part." Fiorello: Sounds a little better this time. Driftwood: Well, it grows on you...Would you like to hear it once more? Fiorello: Ah...Just the first part. Driftwood: What do you mean, the party of the first part? Fiorello: No. The first part of the party of the first part. Fiorello: Ha ha, it's too long anyhow! (rip rip) Now what do we got left? Driftwood: Well, I've got about a foot and a half. Now it says, "The party of the second part shall be know in this contract as the party of the second part." Fiorello: Well I don't know about that. Driftwood: NOW what's the matter? Fiorello: I don't like the second party either. Driftwood: Well you should have been at the first party, we didn't get home till around four in the morning...I was blind for three days. Fiorello: Ay...Look, why can't the first part of the second party be the second part of the first party? Thena you got something! Driftwood: Now...ah...Now I've got something here you're bound to like. You'll be crazy about it. Fiorello: No, I don't like it. Driftwood: You don't like what? Fiorello: Whatever it is, I don't like it. Driftwood: Well let's not break up an old friendship over a thing like that! Ready? Fiorello: Okay. (rip) Now the next part I don't think you're gonna like. Driftwood: Well your word's good enough for me...Now then, is my word good enough for you? Fiorello: I should say not. Fiorello: No, that's no good too. (rip) Hey, how is it my contract is skinnier than yours? Driftwood: I dunno, you musta been out on a tear last night. But anyhow we're all set now, aren't we? 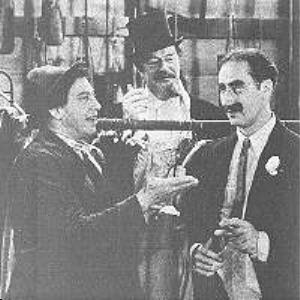 Driftwood: Now just eh...(hands Fiorello a pen) Put your name right down there and then the deal is eh...Then the deal is legal. Fiorello: Eh, I forgot to tell you. I can't write. Driftwood: (shaking the pen) Well that's okay, there's no ink in the pen anyhow. But listen, it's a contract, isn't it? Fiorello: Oh sure. You bet. Driftwood: We've got a contract, no matter how small it is! Fiorello: Hey wait, wait! What does this say here? This thing here? Driftwood: Oh that. Oh that's the usual clause...that's in every contract. That just says...eh...it says...eh..."If any of the parties participating in this contract are shown not to be in their right mind, the entire agreement is automatically nullified." Driftwood: It's alright, that's in every contract! That's what they call a "sanity clause." Fiorello: Ha ha ha ha ha ha ha ha...you can't fool me. There ain't no sanity clause! Driftwood: (Giving up all hope of a successful conversation, takes off carnation and hands it to Fiorello.) Well you win the white carnation!